Free Registry Care is an easy-to-use application that uses high-performance algorithms to quickly identify invalid or orphaned references within the Windows Registry and allows you to repair each problem selectively or repair them all automatically. It can prevent your computer from windows crashes, identifies missing, corrupt, or invalid items, enhance system stability and efficiency, and repair your PC and keep it tuned. ...... One mouse click and Registry Care does the rest. 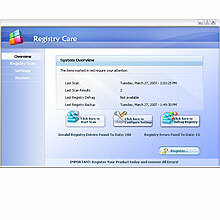 Using Registry Care regularly, Registry Care keeps your PC free from errors and from obsolete, unused or unwanted files. * Some programs write incorrect uninstall information to registry, those files frequently influence on the way that programs work giving you even more unpleasant problems to face. Registry Care prevents your computer from registry errors and fragmented entries. * Free Registry Care uses high-performance detection algorithm to quickly identify missing and invalid references including missing, broken or bad application or Windows shortcuts and links, obsolete Start Menu items, missing application IDs in your Windows registry. Qweas is providing links to Registry Care 6.2.4.4 as a courtesy, and makes no representations regarding Registry Care or any other applications or any information related thereto. Any questions, complaints or claims regarding this application Registry Care 6.2.4.4 must be directed to the appropriate software vendor. You may click the publisher link of Registry Care on the top of this page to get more details about the vendor.